A multinational corporation is mining the Bay’s sand to sell it for profit, and it’s harming Ocean Beach and other Bay Area beaches and wetlands. California is currently allowing Lehigh Hanson, Inc., to harvest 1.5 million cubic yards of Bay sand per year, far outpacing the amount that naturally replenishes the Bay floor. Sand mining reduces the supply of this important resource for areas like Ocean Beach, which is rapidly eroding. San Francisco’s Embarcadero seawall—the manmade barrier between the city and San Francisco Bay—is crumbling. Baykeeper supports a bond measure on the ballot in San Francisco this November to repair it. 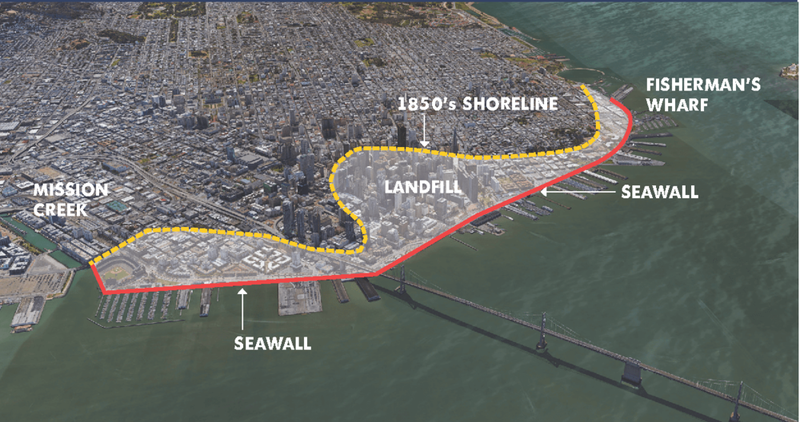 Built in the 1850s, San Francisco’s 3-mile seawall can’t withstand another century of wind, rain, and tide surges, particularly as climate change causes sea levels to rise and storms to intensify. And in the likely event of a major earthquake in the coming decades, the seawall could collapse entirely, submerging parts of downtown San Francisco. San Jose’s creeks and rivers have some of the worst trash and bacteria pollution in the Bay Area. When Baykeeper first discovered the city’s high pollution levels several years ago, San Jose was not addressing the root causes related to their faulty storm water system. (San Francisco Bay, CA) – Sea levels are expected to rise in San Francisco Bay by at least three feet over the next 80 years. Many people around the Bay Area, including those working for local governments responsible for shoreline adaptation, don’t know what that will mean. ShoreView, a new way of viewing the Bay using Google StreetView technology, provides a glimpse into how sea level rise will affect the Bay’s shoreline and Bay Area communities. In a ruling that poses risks for San Francisco Bay, regional regulators recently approved an increase in the refining of heavy tar sands oil at the Phillips 66 oil refinery in Rodeo. The refinery claims the increase is insignificant. But the change amounts to nine more oil tankers on the Bay every year. In a victory for the Bay—and the entire state—Governor Jerry Brown has signed two bills that will help prevent new offshore oil drilling along the state’s shoreline. Baykeeper Field Investigator Sienna Courter headed to the Hamilton Wetlands in Novato with representatives from the California Office of Spill Prevention and Response (OSPR). We're working closely with OSPR to analyze how oil spills affect sensitive sites around the Bay, and the best ways to protect those areas when a spill does occur. Today, a coalition of environmental organizations, Northern California Indian tribal members, and commercial and sportfishing organizations held a press conference at the State Capitol to advocate for strong salinity standards and unimpaired San Joaquin River flows as part of the State Water Resources Control Board’s Water Quality Control Plan updates for the Bay-Delta (Phase I). From her bicycle atop Mt. Tamalpais or along Oakland’s Skyline Boulevard, Jovita Pajarillo experiences San Francisco Bay in her favorite way: taking in the expansive views from afar. The Baykeeper Board member also likes to get up close and observe wildlife, especially small shorebirds.